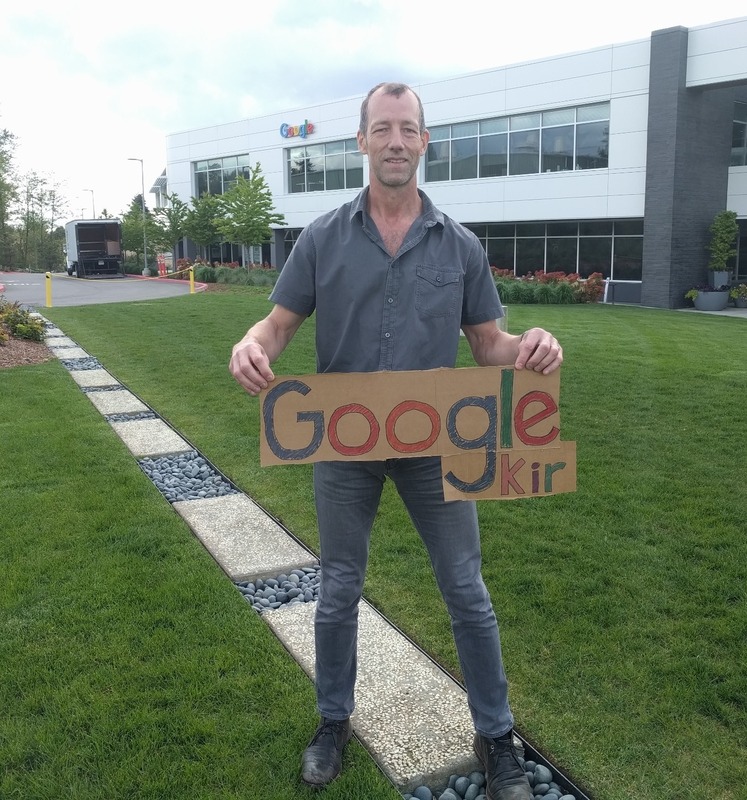 Commute Challenge 2018 happened in September 2018 with videos being posted at tinyurl.com/commutechallenge2018. The 2018 commute challenge may be even better than the original – certainly the projection values are much higher, and there was much better media coverage. I was working in London for a few weeks so I did a mini commute challenge. Normally I take the tube but May 1st I unicycled and got some beautiful video once I arrived, available here, linked on twitter here. For a radio interview discussing Commute Challenge 2017 go here. A brief blog post about commute challenge is on the Bike All Over blog, here. And, 425 Business Magazine did an article on alternate commute methods – you can find it here, announcement tweet here. And, a brief video summary of the commute challenge is below. I’m lucky enough to live just 2 km (1.25 miles) away from the place where I work. Because of this – and because I dislike driving – I tend to commute in a variety of non-car ways. 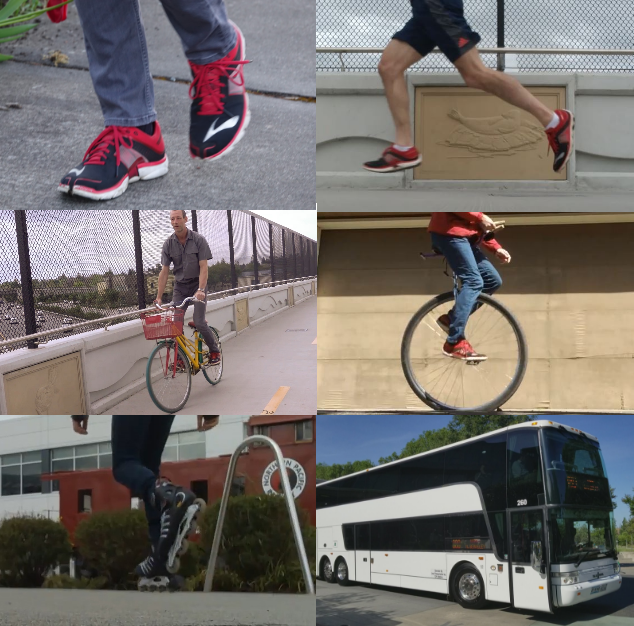 A few months into my new job I noticed that I tended to use about six different commute methods on a regular basis: walking, running, cycling, unicycling, inline skating, and taking a bus. Having that many commute methods got me thinking: how many commute methods could I come up with? Could I commute to work using a different method every work day for a month? And so was born the commute challenge. After much procrastination I tried this challenge in April 2017. One month, twenty work days, twenty different commute methods. Let me know if you see this video hosted somewhere other than youtube. 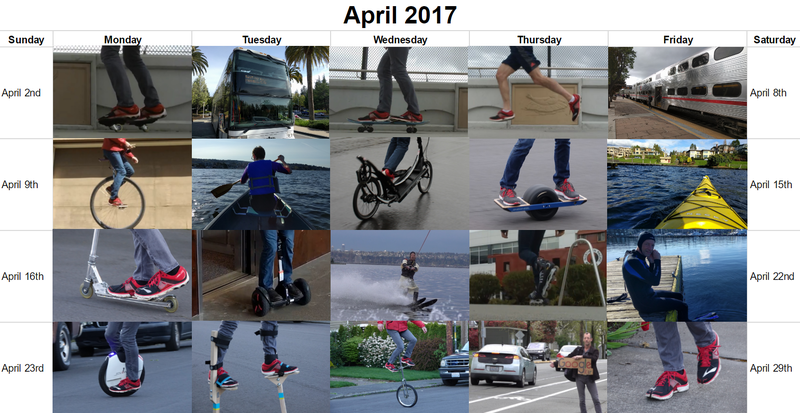 Observant viewers may note that the order of commuting methods is different between the video and the calendar. The calendar shows the actual order of events, whereas the video was edited and rearranged as needed in order to tell the story best. The important thing is that all twenty commute methods (and a few others not shown) actually happened during the month, with a different one every day. Riding on a OneWheel, Segway Mini, or SoloWheel are all fun ways to get to work. They all scratch my unicycling itch, and they all help reassure me that my balance has adapted to only having one inner ear. And I enjoyed the Ripstick and the surprisingly practical kayak. But the winner for the most fun commute has to be water skiing to work. Sure, it’s not practical. We practically drove past work on the way to the house of the friend whose boat towed me. 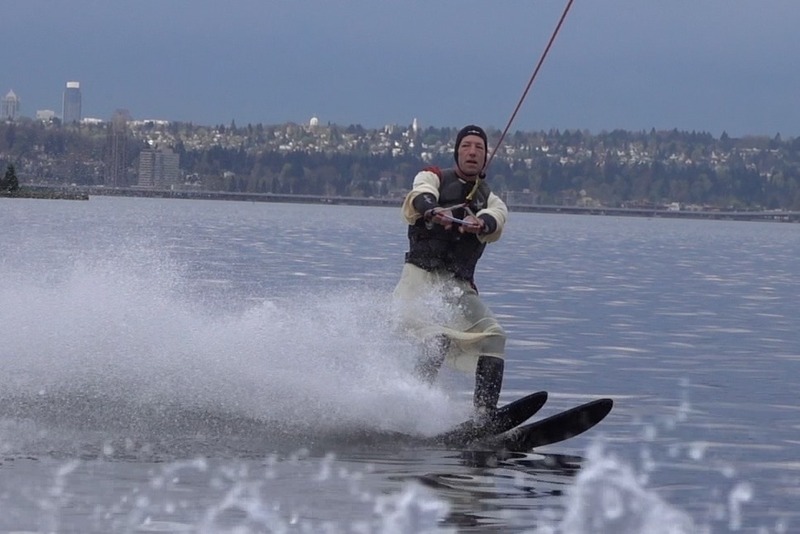 But when you start your day water skiing in a Jesus costume across Lake Washington you just can’t stop smiling. The cold water woke me up, the music was inspiring, and it felt great to do something improbable before breakfast. Swimming. Hands down, swimming. The skateboard was slow and dangerous (probably due to my poor skills), the ElliptiGo was inefficient and uninspiring, and the canoe (and, to be fair, water skiing) required a support vehicle. But swimming was the only commute method that was simultaneously unpleasant, inefficient, and potentially dangerous – it’s the trifecta! 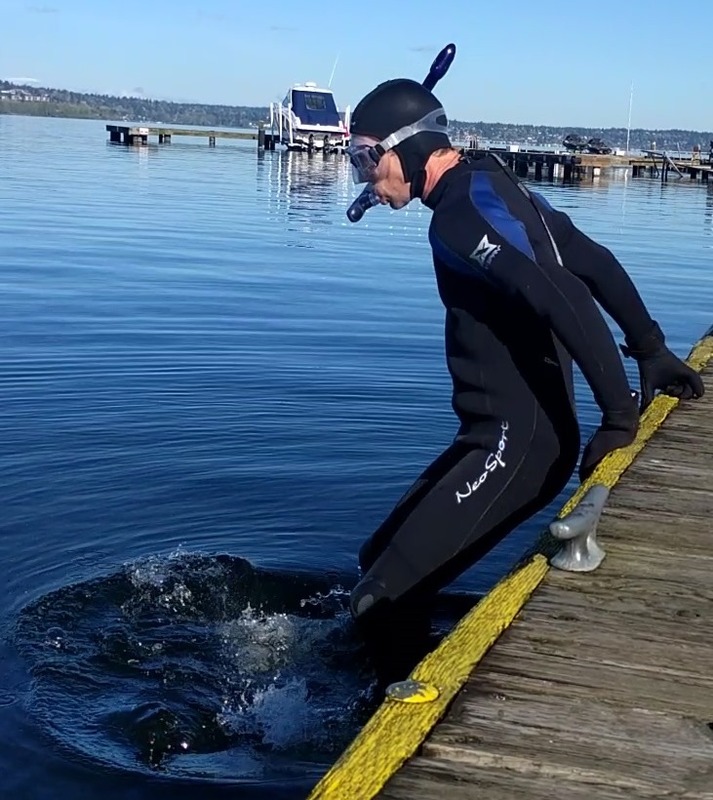 The water was cold (about 8° Celsius or 46° Fahrenheit) so I wore two wet suits and neoprene boots, gloves, and a hood, This kept me warm enough (as long as I didn’t put my face in the water) but made it hard to move or breathe. Luckily the swim was only about 600 m (0.4 miles) and I had a safety cyclist ready to watch me drown, so I made it, but “zero stars, would not swim again.” I recommend that you save swimming to work for August, when it will still be inefficient but at least not as unpleasant and dangerous. I tried to get a Waymo ride but was unable to arrange it. Even though biking and city bus are two of my usual commute methods I never actually got around to them. I have at least half a dozen other unicycle types that I could have used to expand my commute methods list. I thought about borrowing a friend’s penny farthing but I didn’t have the right outfit for that ride. I regret not being able to commute via helicopter, sky diving, slip-and-slide, horse, tight wire, or human hamster ball. Life is too short to spend it stuck in traffic, or looking for parking. While not everybody has the diversity of commute options that I have, I think that there are some people who commute alone in a car because they haven’t fully considered the costs (financial, societal, environmental) or because they haven’t considered the health and joy benefits of trying other options. Busing and carpooling are available to many and while they may take more time than driving alone in a car, they may be better uses of your time. They might not be as much fun as water skiing, but if you can read a book or talk to a friend while commuting then that’s progress. Thanks to Maria, Sarah, Seth, David, Gina, Mike, Chris, John, Alex, ulbi, Kurt, and Helen for all their support. The music for the video is Back In Summer by Nicolai Heidlas, courtesy of HookSounds. I use my bike and other non-car methods to commute partly because it’s better for the world (fewer greenhouse gases, one less car on the road, one less parking spot used) but mostly because it makes me happier. Rather than explain why a shorter non-car commute is good for happiness I’ll just link to this video about One Scientifically Proven Thing Actually Makes People Happier. This post can be found at https://tinyurl.com/commutechallenge2017. This entry was posted in Commuting, Environment and tagged Commuting, unicycling. Bookmark the permalink. This gets another Totally Freakin’ Awesome™ Award, this time in the sphere of human activity! I asked about a self-driving car but apparently it was still just a bit too early. Pogo Stick would be great. My pogo stick is pretty terrible, but I did enough searching that I now see ads for $400 pogo sticks everywhere. The whole thing made me smile. I’m so jealous! I’m almost 7km from work and there’s basically no waterways between me and the office. I’ve only done four (ho-hum) methods: bus, running, biking, and car, but you’ve given me inspiration to add some new ones this summer! Great! The extra 5 km definitely makes options harder but I hope you do add some new methods – post here if you do. And remember, if you officially label it “Commute Challenge” then people will lend you cool toys! Thanks! Maybe I’ll grab a tank and do it underwater next time – but under warmer water. Time to read up on Lake Washington scuba regulations I guess. Hmmm. Is it more satisfying to pedal up Market St., going faster on pedal power than any of the cars, or to coast down State St., going faster on gravity alone than any of the cars? They’re both so fun that I find it hard to choose. sadly enough, I take the bus (2 different ones) to do my 32km commutes. In 2020 Montreal will be forcing us to take a train. I will then need to walk, take the shuttle to the bus which will take me to the train. I already lose 2h a day. If i was riding a bike it would take around 3.5h / day. I would love to work from home again. You did a great job, I’m jealous!